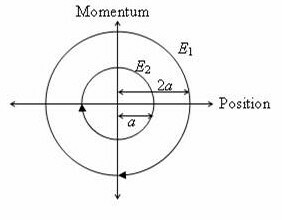 The amplitude of the resultant simple harmonic motion is A itself but the initial phase of the motion is now π/3. 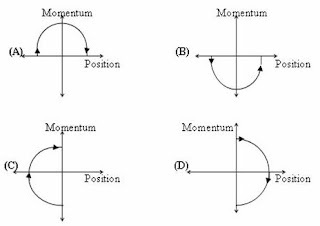 You can find a useful post on simple harmonic motion here. Phase space diagrams are useful tools in analyzing all kinds of dynamical problems. 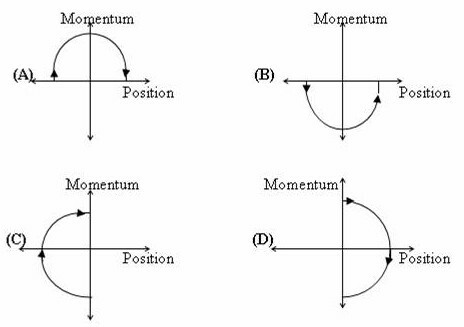 They are especially useful in studying the changes in motion as initial position and momentum are changed. Here we consider some simple dynamical systems in one–dimension. 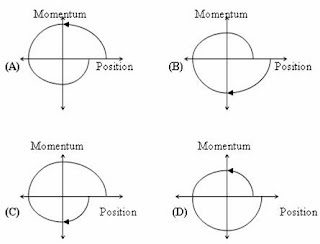 For such system, phase space is a plane is which position is plotted along horizontal axis and momentum is plotted along vertical axis. 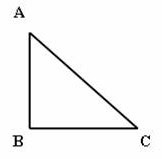 The phase space diagram is x (t) vs p(t) curve in this plane. The arrow on the curve indicates the time flow. For example, the phase space diagram for a particle moving with constant velocity is a straight line as shown in the figure. 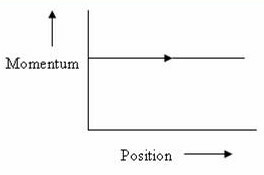 We use the sign convention in which position or momentum upwards (or to right) is positive and downwards (or to left) is negative. The arrow on the diagram shows the flow of time. Initially the ball is on the ground and its velocity and momentum have maximum positive values (since it moves upwards). At the highest point of its trajectory the displacement of the ball has maximum positive value but its momentum is zero. Finally when the ball just hits the ground, its displacement is zero but its momentum has maximum negative value(since it is moving downwards). The correct option is obviously (D). So when the amplitude is doubled, the total energy is quadrupled. Thus E1 = 4 E2 as given in option (C). [The phase space diagram given in the above question represents an undamped simple harmonic motion since respective amplitudes appropriate to the initial conditions remain constant. If the simple harmonic motion is a damped one, the curve will be a spiral, proceeding inwards]. (i) The amplitude of oscillations must decrease with time [which is not the case in diagrams (C) and (D)] as the viscous forces in water damps the motion of the system. 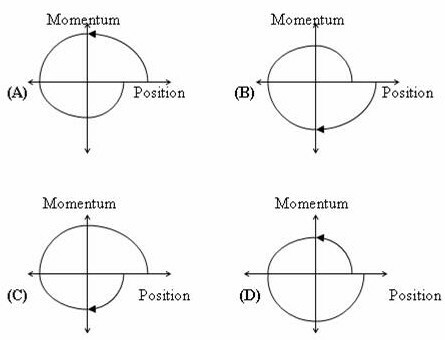 (ii) When the displacement is maximum positive value (corresponding to maximum positive position co-ordinate), the momentum is zero and is going to increase in magnitude in the negative direction [unlike in the case of diagram (A)]. Since the current loop is placed in a uniform magnetic field, the net force acting on the loop is zero. [Note that a current loop in a uniform magnetic field will experience a torque but no net force. If the magnetic field is non-uniform there will be a torque as well as a net force]. Since the arm AB of the loop is parallel to the magnetic field, the magnetic force on AB is zero. 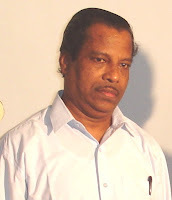 Since the magnetic force on the arm BC is F (as given in the question), the magnetic force on the arm Ac must be – F (so as to make the net force on the loop zero). The magnetic force will be zero since the electron is projected parallel to the field. The electric field will exert a force opposite to the direction of motion of the electron and hence its speed will decrease [Option (3)]. You can work out this question either by using the concept of centre of mass or by applying the law of conservation of momentum. As the centre of mass of the system is initially at a distance of 10 m above the floor, the distance of the man when the stone reaches the floor will be 10 + x = 10.1 m.
[You can apply the law of conservation of momentum and obtain the ‘recoil speed’ v of the man from the equation, 50×v = 0.5×2, from which v = 0.02 ms–1. The time taken by the stone to reach the floor is 10/2 = 5 s. During this time the man will move up through a distance 0.02×5 = 0.1 m so that when the stone reaches the floor, the man will be at a distance 10 + 0.1 = 10.1 m above the floor]. Since the particles are initially at rest, the speed of the centre of mass of the system is zero. Since there are no external forces on the system, the centre of mass will continue to be at rest even though the particles are moving under the action of their internal attraction. Therefore the correct option is (3). By trying a search for ‘centre of mass’ using the search box provided on this page, you can access all posts on centre of mass on this site. You will find some additional posts on centre of mass at AP Physics Resources.